Last night I watched a little bit of It's the Great Pumpkin, Charlie Brown, before being called away to solve an equipment crisis in the sacristy. Any praying person has to identify a little with poor Linus, as his primitive belief in the Great Pumpkin, though doomed and ultimately inadequate, has some elements of theological sophistication. First, he knows that the Great Pumpkin will not appear if he is dismissed or disbelieved. He requires sincerity and faith, just like the God for Whom believing is seeing. And one only has to peruse the gospel according to John lightly to see that this is indeed the case; to believe and to see God are ultimately the same thing. Meister Eckhart knew this when he famously said, "the eye with which I see God is the same eye with which God sees me." Second, Linus knows that the Great Pumpkin is not just a fulfiller of selfish human wishes. Unlike Santa Claus, he does not take requests. He brings you something, yes, but you can't choose it and are only called to be grateful. Third, Linus knows that, despite the failure of the Great Pumpkin to appear, or better, our failure to allow him to appear, Linus must remain faithful. And who could let this day go by without the eponymous song by the greatest band of all time, the Misfits. For those who read or blog in Spanish, check out La Parroquia Maria Madre del Buen Pastor. Yesterday I had my first baptisms ever. It was quite an experience, trying to preach, sing, and lead prayer over the cacophonous din of babies and children, and to maintain some sense of ritual with little people running around all over the place. At one point I turned around from the font and saw some little kid sitting on St. Francis's altar! I wasn't mad though; in fact it made me think about the unstoppable energy of life and love that God overflows over our world, despite all our efforts to make life gloomy, bitter, and sad. I really appreciated the four movements of the ritual. We start in the back of the church because the children are beginning their Christian life. Then, as always, we pause to listen to the Word. Having heard the Word, we move to the font for the anointings and baptism. Finally, we arrive at the altar. The altar is the tomb of Christ, in which the newly baptized are now buried. It is also the cross of Christ, on which water and blood flowed from Jesus' side for them who are now washed in the blood of the Lamb. Right after my own baptism I remember hearing the deacon whisper to himself, "beautiful." Now I know how he felt. Check out this gem: Our Lady's Little Scribe, the blog of the Our Lady of the Pearl fraternity of the SFO in Pearlington, Mississippi. I'm really bad about these memes. I don't respond when tagged, and even if I do, I don't tag others as instructed. But this one that Paula has tagged me with is just too tempting to pass up. 1. I believe that I had mystical experiences as a little kid. 2. The first time I ever knew of any connection between classical philosophy and Christianity was in the Iron Maiden song, Alexander the Great. 3. Since I left home seventeen years ago to go to college, I have lived at 17 different addresses. 4. I celebrate my baptismal name day on the feast of Charles Lwanga. In odd ways, I have come to appreciate him more and more over the years. 5. The first place I ever read the Scriptures at Mass was inside the Lord's tomb at the church of the Holy Sepulchre in Jerusalem, and the first place I was ever an extraordinary minister of Holy Communion was in the Capuchin church in Cartago, Costa Rica. 6. Here on my desk I have a sliver of wood from St. Bonaventure's cell at the Franciscan hermitage of Monte Casale. 7. When I noticed that I was tagged for this meme, I was listening to Rammstein's Rosenrot. Check out my latest delightful discovery of the Franciscan family blogsophere: Franciscan Diary. I'm almost seven weeks into my priesthood. It's really an intense change of life, both inside and out, and I'm still adjusting. For some things I could have done a better job preparing myself, and for others no preparation could have been possible. But in everything there are moments of such gratitude that I'm not discouraged. One of these was one night this week when I felt as if I was concelebrating a Mass for the first time. Of course I have concelebrated on several occasions, including at my own ordination and at a Mass of Thanksgiving of one of my classmates. But this was the first time I was in a group of priests concelebrating around their own bishop, in our case Cardinal Egan. As the General Instruction of the Roman Missal puts it, concelebration "appropriately expresses the unity of the priesthood, of the Sacrifice, and also of the whole people of God" (199) and "To be held in high regard is that concelebration in which the priests of each diocese concelebrate with their own bishop" (203). I appreciate what the GIRM says about unity. 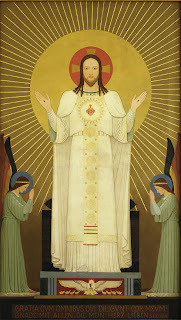 There is one Eucharist, and there is one Risen Lord, risen as Body of Christ that is both blessed Sacrament and assembly. It's a stressful week here where I work. We have eight funerals in this five day work week. For me, it means I am taking care of three of them, giving me a kind of 'evening came and morning followed' daily rhythm of wake-funeral-committal for three and a half days in a row. It also means I have to keep several sets of family and multiple homilies rolling around in my head at the same time. Trials will never be lacking in religious life, nor does God want them to be. Since he brings souls there to be proved and purified, like gold, with hammer and the fire, it is fitting that they encounter trials and temptations from human beings and from devils, and the fire of anguish and affliction. The religious must undergo these trials and should endeavor to bear them patiently and in conformity to God's will, and not so sustain them that instead of being approved by God in this affliction he be reproved for not having wanted to carry the cross of Christ in patience. Since many religious do not understand that they have entered religious life to carry Christ's cross, they do not get along well with others. At the time of reckoning they will find themselves greatly confused and frustrated. Cuatro Avisos a un Religioso, 4. His insight into the inability to get along is priceless. This is the translation of Kavanaugh and Rodriguez, which is really a treasure. Check out their edition here. I always like the feast days of the great reformers of religious life, probably because we are so in need of them now! Peter is one my favorites because he was part of the great movement of discalced reforms that was going on in the Iberian peninsula (and elsewhere) in the 16th century. We know this movement mostly from the Carmelites Teresa of Avila and John of the Cross and the Discalced Carmelite Order (OCD) that came out of it. Brother Peter's feast day reminds me that the reforms of our religious life were movements larger than particular orders or traditions, and it gives me hope that religious life is reformable for our time. Before I was a friar I was in the direct care business with the mentally retarded/developmentally disabled community. One of the most physically and emotionally strenuous aspects of my job was doing "outings." They were necessary though. Everyone deserves to get out of the house, to try to shop for themselves as well as they can, to go out for recreation or a treat from time to time. You got to learn first hand how inaccessible to wheelchairs many places still remain, and you had to deal emotionally with the folks who stared at the clients or who looked at you the way people look at you when you have a cute dog. Sometimes I see similar folks on an "outing" with their staff and helpers. And I'm reminded to pray for all of them, in thanksgiving for those having a good time, and for the patience of those who are working. And then I think about the infinity of life and work situations of which I am ignorant and thus am not led immediately to an automatic compassion, and I pray to be patient and compassionate even when the struggles and sufferings of others are hidden from me. And he began to tell the people this parable: "A man planted a vineyard, and let it out to tenants, and went into another country for a long while. When the time came, he sent a servant to the tenants, that they should give him some of the fruit of the vineyard; but the tenants beat him, and sent him away empty-handed. And he sent another servant; him also they beat and treated shamefully, and sent him away empty-handed. And he sent yet a third; this one they wounded and cast out. Then the owner of the vineyard said, `What shall I do? I will send my beloved son; it may be they will respect him.' But when the tenants saw him, they said to themselves, `This is the heir; let us kill him, that the inheritance may be ours.' And they cast him out of the vineyard and killed him. What then will the owner of the vineyard do to them? He will come and destroy those tenants, and give the vineyard to others." The parable is itself a riff on Isaiah's "Song of the Vineyard," in which God sings a lament over how poorly his people have cared for the vineyard of the world he entrusted to them. In the synoptic parable, of course, the landlord finally sends his own son to take care of the situation, but the tenants kill him. The parish I work in is dedicated to the Sacred Heart, so it's a joy to celebrate the feast of St. Margaret Mary Alacoque, who gave us this devotion. Her image is it at the very top of our sanctuary, above the marble baldochino that reads Cor Iesu Sacratissimum, Miserere Nobis. It's really something to imagine God as a Heart. It might save us from images of God that are more like a boss or landlord. To me the Sacred Heart suggests that God is a loving drive, a desire, a passion, sometimes broken, but always a com-passion. "It seems to us that we are giving all, but it's more like we offer God rent or the fruits while we hold on to the root and the ownership." With cutting insight like that, it's no wonder she got to be the first woman declared a doctor of the Church. One thing I've been doing in these early days of my priesthood is trying to learn the old vesting prayers. I've got the hand washing one down already, mostly because it is engraved over the sink in our sacristy. And I don't use an amice, so I skip that one. What I've been thinking is that they need one piece of updating, because part of vesting in our time is putting on the wireless microphone. In fact, many albs are made nowadays with pockets for them and openings for their wires. I put the microphone on after the alb and before the cincture, and I think this needs a prayer too. So, you liturgists and Latinists, get to work. I'm getting more comfortable each day with presiding at Mass, but as I do I'm able to really pray the Eucharist. And as I'm able to pray, certain moments strike me more forcefully. What goes through my mind is more like the question, 'what kind of God is it that decides to hide himself in bread?' It turns all of our expectations and human expectations of deity upside-down. In whatever way it seems better to you to please the Lord God and to follow [in his] footstep and his poverty, do it with the blessing of the Lord God and my obedience. Franciscans love to puzzle over the odd singular, "footstep." For me, I think of it as the Cross. For when the almighty, eternal, spiritual God passes over and makes an impression on time and space and human life, that impression is the crucified Christ. That is, a burning love that is literally dying to save each and every one of us from the misery we have brought upon ourselves and each other because of our selfishness and sin. I imagine the Franciscan vocation as a resolution to put our feet into the footstep of the Cross, trying to walk within and according to the burning love of the Crucified. Thanks to SFO Mom for turning me on to this one! I can tell this is going to be a new theme for posting! One thing they don't tell you in theological studies is what it is that will become your principle tool as a priest. What might you think it is? A chalice and paten? A confessional? A preaching style and voice? It's none of these things. I've learned that the principle tool of the presbyteral ministry is the telephone. It's used to consult with upcoming brides, to counsel and give reminders to the parents of those to be baptized, to check in on the sick, and to arrange the blessings of new homes, cars, and pets. The telephone is certainly a critical piece of ministerial equipment.